Rochester Americans Announce This Years' Hall Of Fame Inductees · Let's Go Amerks! Â From Amerks.com: (Rochester, NY)â€¦ The Rochester Americans announced today that Craig Charron and Gates Orlando will become the 43rd and 44th members of the Amerks Hall of Fame on Sunday, April 6th at The Blue Cross Arena.Charron made his first season with the Rochester Americans in 1995-96 a memorable one. He led the club with 43 goals, 52 assists and 95 points, earned team MVP honors and helped the Amerks defeat win their sixth Calder Cup Championship. The former center went on to have a brilliant five-year career with the team and stands as one of the most decorated Amerks in team history. â€œSharkyâ€ played in 335 games and recorded 122 goals and 190 assists with the Amerks (1995-98, 2000-02). He was also a two-time winner of the teamâ€™s MVP award, scoring title, McCulloch Trophy for community service, Fairand Oâ€™Neill Award for sportsmanship, and the Booster Clubâ€™s Most Popular Player award. Charron was originally drafted by the Montreal Canadiens in 1988 out of Division I UMass-Lowell. His career lasted 12 seasons from 1990 to 2002, as he played in 726 professional games. Charron was a two-time member of the US National Team and represented the United States in the World Championships in 1995 and 1998. 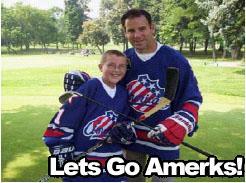 His USA Hockey bloodlines run deep, as he is the nephew of famed â€œMiracle on Iceâ€ goalie Jim Craig. In eight full American Hockey League seasons, he was named to three AHL All-Star Games and his teams made the playoffs each season. In 1997-98, he was also named the AHLâ€™s Fred T. Hunt Award winner, which is given annually to the player that best exemplifies sportsmanship, determination, and dedication to hockey. Orlando enters the Hall of Fame after an impressive career locally and internationally. His career spanned parts of 15 seasons and included a Calder Cup championship and two trips to the Winter Olympics. The Montreal native was selected by the Buffalo Sabres in the eighth round (164th overall) of the 1981 NHL Entry Draft. Orlandoâ€™s journey began at Providence College and landed the first-year pro in Rochester in 1983-84. In the regular season, he recorded 15 points in 11 games and was clutch in the playoffs, notching 14 points in 18 games as Rochester advanced to the Calder Cup Finals. It was a sign of things to come for Orlando, whose Rochester career covered five seasons (1983-1988). Along the way, the right wing amassed 64 goals and 92 assists for 156 points in 120 games. He also appeared in 45 playoff games and recorded a point per game, notching 15 goals and 30 assists. In 1986-87, he was a member of the Amerksâ€™ fifth Calder Cup. That season was also his best offensively, as he played in 44 games and recorded 22 goals and 42 assists during the regular season. In the Amerksâ€™ march to the Calder Cup, he recorded nine goals and 13 assists in 18 games. While with the Amerks, Orlando was also often called up by Buffalo and played in 98 NHL games in his career. He would register 18 goals and 26 assists from 1984-87. Following the 1986-87 season, Orlando began his international career. In 1987-88 he began the season in Italy before returning to finish the season with the Amerks. He would then spend the next 279 out of 280 regular season games playing overseas. His lone North American game was his last in 2003-04 with the Albany River Rats of the AHL. Orlando starred in Italy (1987-94) with the HC Meran, Bolzano and the Milano Devils teams. Internationally he excelled for Italy at the “B” Pool World Championships. He was named the best forward at the 1990 tournament and selected to the all-star team when he led Italy to the “B” Pool title in 1991 and promotion to the “A” flight. He also took part in the 1994 Lillehammer Olympics and the 1998 Nagano Games and was a domestic star for the Swiss team SC Bern.